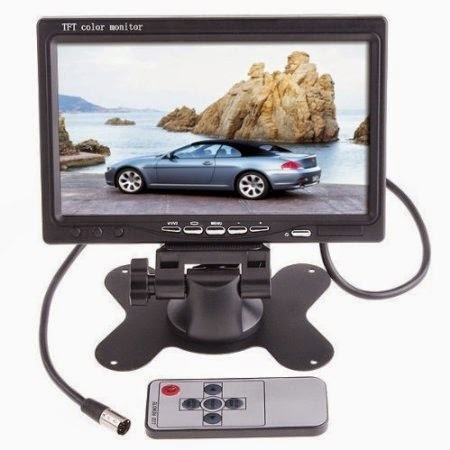 I bought one of these - what sold me was the price, the 800x600 resolution and the 7"size. I had a Dangerous Prototypes ATX breakout board hooked up to an old power supply, thinking that the 12 v could be supplied to the monitor. However I found that if you draw current from only the 12v supply and nothing from the 5v rail the power supply thinks something bad is happening and shuts down. The second issue was even though it powered up - plugging it into the rca video gave no picture. Turns out that you had to edit the /boot/config.txt on the PI. NOOBS sets it to only work with HDMI and I had to comment out a few lines. Now I had video from the pie - it was a bit pixely - but entirely readable. The arduino IDE in the GUI is larger than the screen resolution. But right clicking on the taskbar at the bottom of the screen and selecting maximize fixed that. or should i say i could now select the menu items - but editing in this mode would be impossible - So its plug in the big monitor when editing, and just use the little monitor to view output. Opening LOCALHOST on the browser gave a perfectly readable weewx screen. This took awhile - so give yourself time. I did not want to get mired with any customization the first time around, so I decided I would always take the defaults whenever possible. After I fully understand all that got installed, I could mess things up with customization later on. Come on - you have never bollixed up a working system trying to customize it, have you. My primary goal was a simple, no fills, working system. set up the wireless since I don't have a hard wire to the PI. http://www.weewx.com/docs/debian.htm This last link has lots of information - especially where the various parts of weewx gets installed from the deb package. Then plugged thumb drive into powered hub on the pi and copied to my home directory on the pi using the GUI file manager. Make sure you have the latitude, longitude and altitude available. It will be asked for in the installation. This saves editing config files after install. I chose the Simulator driver just to get something on the screen. Installed Python serial. I will use this to get serial data from Arduino. I kind of got stumped then - I found that the nginx had set up its root to point to /usr/share/nginx/www. Weewx was putting its files at /var/www/weewx. I tried to set a link from one to another - but the Linux LN link documentation read like graduate physics to me - so I just edited the ngnix conf file - but not the one that is documented. So now I have all three pieces. 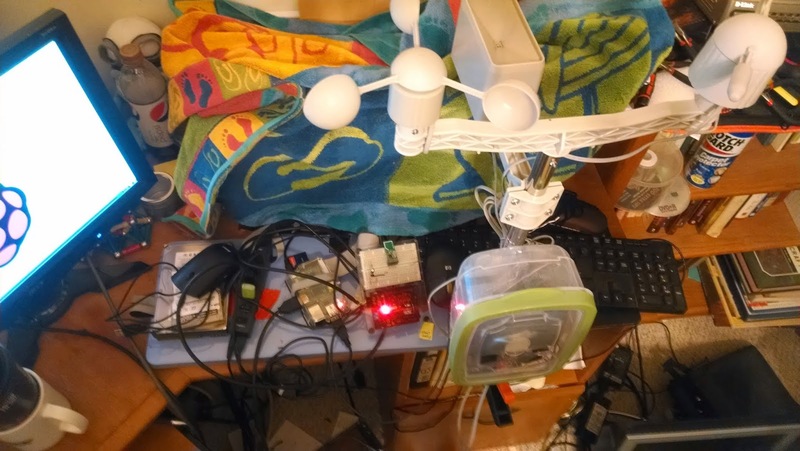 The weather station transmitting, The Arduino inside receiving, and weewx running. Not all I have to do is get the serial data from the arduino into weewx. I am still working on the receiver part - but i think i have the outside part pretty much figured out. Use a battery and charger to keep it running as long as possible before replacing. The well head i am using as a mounting base - is 80 or so feet from the back door. Plus i have alread tun over a previous setup's rain gauge cable - never want to do that again. Interfacing with Sparkfun weather instrument. I grabbed some code from here and hooked it up and tested it. The code uses interrupts to get the values from the Anemometer and Rain Gage - and relies on Millis() to calculate the values display. It is a single source Solution - and uses the most power since the the Arduino runs at full power all the time. Power Down sleep mode turns off all the clocks and counters on the chip. I thought through many scenarios to try and figure a way to use other timing sources. One promising one is using a 32,767 watch crystal - but since i am using a pro-mini - getting to the pins was more than I wanted to deal with. Then I saw something on the forums and had a DUH moment - use the outside to gather the raw data - and do data processing on the receiver. The network header adds 8 bytes so I had to fiddle with the types to make it all fit in 32 bytes. This time I am going to do it!!!! 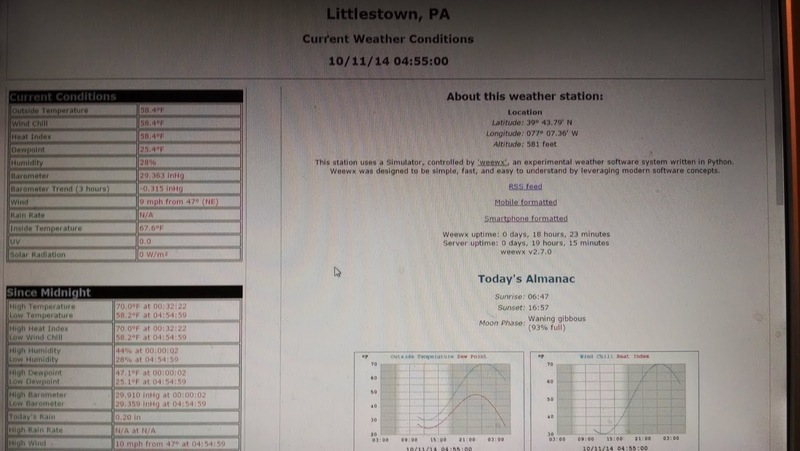 Publish Weather information to the web. So far I have a weather instrument from Sparkfun, a temperature sensor , all hooked up to an arduino mini clone. 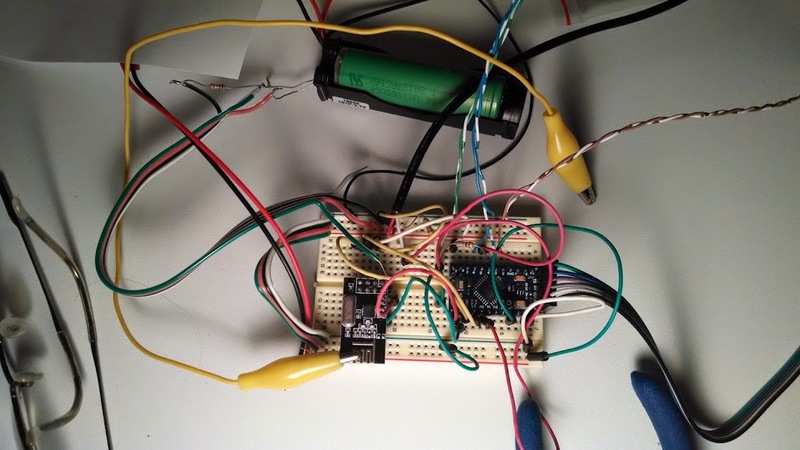 A sketch on the arduino gets the sensor data and sends it via an NRF24l01+ . Power is supplied by a solar cell charging an old laptop lithium battery. Its the inside part that has always been the rub. I have tried with various arduino sketches to get the data and send it out to a PC then on to the weather site. This time I am going to plug the arduino into a Raspberry PI and use weewx. Low power and always on - plugged into the big screen to look every once in a while. if the sparkfun weather station is one-wire, then you can use the OWFS driver. you will have to make a few modifications, depending on the rain bucket and anemometer you use. the first approach would have fewer moving parts, but you will need to know how to read/write serial. this is really easy to do inpython using pyserial, but if the device has odd protocol or semantics then you might have to use fctl/select, which is considerably more challenging. the aculink.py v0.4 driver is misnamed. actually it is a "FileInput" driver - it simply reads name=value pairs from a file then inserts them into weewx loop packets for processing. I set up shop in the living room so I could fiddle with he nrf24 radios and Arduinos between commercials on the TV. I bought a few arduino 3,3v pro minis and some radios with the zigzag antennas. I loaded the example to test the radios out and all I got was failed and time out packets. The receiver was getting the packets periodically but timed out in the ack part of the transmission. The next thing I did was lower the transmission speed to 250k, but still no joy. Thinking that there was a loose connection I pressed down on the radio and noted that it started completing transmissions. It seemed if I touched the antenna on the board the transmissions completed - as soon as I removed them - they failed. So power or antenna was the problem - rechecked the power and saw an alligator lead wire laying on the table and just clipped one on the radios antenna on the PCB and voila (it's yellow in the picture) - perfect transmission. The was probably all kinds of mismatch between the antenna and lots of vswr - but it worked. I am just wondering what would be a better way of putting a wire on the board to make a matched antenna. update - it seems that a full wave antenna for 2.4ghz is amazingly close to the length of the alligator clip length (~4.92 inches) - who have thunk it? I started out in personal computing with a soldering iron in my hand - then along came the radio shack model 1 - it was enthralled... All that computing power on my desk. Now i run into a Raspberry pi and it is a little dynamo - I have it right now installing mysql . I have installed apache, and have had it updating Xively with the %busy variables for a day or two now. Even have a Arduino mini sending some data over. Whew - lots of Goggling and lots of cut and paste. It is exciting to see the Pi really busy - it is more fun trying to keep the little green bar in the bottom right corner pegged at 100%. 2) Get something connected to the Arduino (temp and/or humidity and/or Barometer) Sending it all up to Xively and saving it locally. In the very near future hook up some nrf24l01s to some Arduinos and put out in the Yard , basement all over the house... You get the idea. In spite of a severe cold - or probably because of it I decided that I would play with my pi. The goal is to get the weather information from my Weather Station inside and send it out to the internet of things someplace. I have had it running in the past - but it invloved me leaving the desktop running and eating way too much power. I have seen a lot of elaborate lashups using spi and whatnot hooked into the pi and the nrf24l01 - but I figured that I would do it different. Let the Pi do what id does best and the Arduino do what it does best. The pie is a Unix computer and will do the heavy lifting since it has internet connectivity built in and lots of ways to display the data or send it out to one of the IOT cloud servers. The Arduino because of its robust pin protection and scads of code to talk to the nrf24l01. 1) Run the Pi from a hard drive. I have seen lots of posts of sd card failures after a while. They have a limited R/W Life. Plus I have a bunch of old hard drives. 2) Plug the Arduino into the Pi and run the Arduino IDE there. This keeps me from having to run all over the house and finding various things to get a sd card reader set up and into one of my computers. It is so much better to keep it all in once place. The key to all this is a Powered USB hub - it has everything plugged into it and powers the whole show. I found one at newegg that has 7 ports and an on off switch. Keyboard and mouse go in the end - everything else goes in the top - to reboot a locked pi without dealing without unplugging a USB - there is that switch - very convenient. The PC has a hundred watt power supply and uses a lot of power spinning up 3.5 terabytes of hard drive storage. The power plug for the hub is 10 watts, very efficient. I won't bore you with the details - others have already done an excellent job of documenting what to do. Putty and vncviewer installed on the PC and lets me get the monitor the PI is plugged into back onto the PC. Sounds easy - and it was - but it took a while - The Pi is not know known for its speed.